-We also serve grab 'n' go breakfast daily for grades 5-8! Pop-tarts, Granola Bars, Fresh Fruit, Breakfast Sandwiches Served Daily! Option C Available Monday-Thursday's (Grades 3-8 Only): Fresh salad bar will be served daily that includes fresh fruits/vegetables, lean protein, and whole grains. This option is served with your choice of milk. 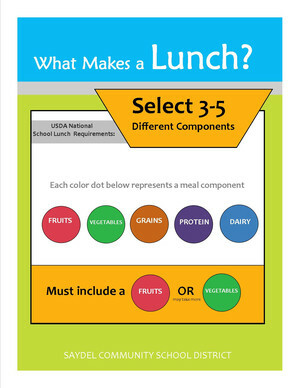 Schools across the United States offer meals to students that meet the reimbursement guidelines from United States Department of Agriculture (USDA). School meals are priced as a unit, and we receive federal and state reimbursement to offset our costs. If students choose at least 3 components (milk, fruit, grain and/or meat/meat alternate), their breakfast will be at the reimbursable meal rate. If they only choose 2 components, we must charge for each item separately, as the selections would not meet the USDA’s requirements for a complete reimbursable meal. Yogurt This is a reimbursable breakfast! Grades JK-2 will have two options daily that will be offered to the student: The meal will include, whole grains, lean protein, fresh fruits/vegetables, and milk. Sports Grab ‘n’ Go Meals are available to purchase.After school snacks are available to purchase or reimbursable if they student has after school activities to attend and will be on site. Snacks are offered 3:30-4:00 on regular scheduled school days. Middle School Salad Bar will be available daily offering fresh fruits, vegetables, lean protein, whole grains, and multiple salad dressing offerings. We will also be featuring produce that is local and seasonal. Elementary School Fruit/Vegetable Bar will be available at lunch time giving kids the choice of what kind of fruits and vegetables they enjoy. They will need to choose to take ½ cup of whatever they enjoy. Preschool Meals will be served family style and children will be able to learn about portions sizes they need to make their bodies healthy. The preschool will be offering Farm to Preschool nutrition curriculum and the children will participating in fruit and vegetable tastings monthly.